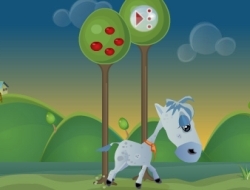 In this fun animal game you will race your horseys around the track and try to win each race you participate in. Choose the one you like the most and then head down to the tracks. Move the cursor to adjust your speed, but remember that going fast may have some disadvantages as you cannot see the hurdles at that speed. You should try to find the right speed for you so you will not trip on every hurdle. Each jump will consume energy and if you run out of it, the horsey wont be able to jump anymore. However, you can collect apples that will fill up your energy bar and you can jump again and win the race without losing any speed because of the tough to jump-over hurdles. Use the mouse to adjust the speed and click to jump. Horsey Racing 0.00 between 0 and 10 based on 0 votes.